1. Clear your face from any excess oil, and put on Maybelline’s Foundation SuperStay evenly over the face. 2. If you have any imperfections, blemishes or dark circles on your face, make sure you cover them up with Maybelline’s Concealer SuperStay. 3. Take Maybelline’s ExperWear Eyeshadow in Golden Halo and put it on your lids. Do not cross your natural lid line, and do not overuse the eyeshadow, because we’re trying to achieve a natural look. Use side-swept technique while putting the eyeshadow on. 4. Take Maybelline’s EyeStiletto Ultimate Eyeliner and tightline your waterlines, both the upper portion and the lower portion. Slowly, try to line your eyes until it forms a thin trace of cat eyes effect. Do this step for your upper and lower portion of your eyes. 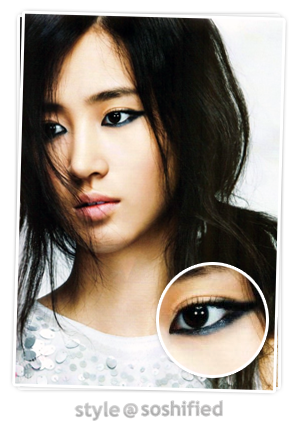 Then, take your Maybelline’s Expertwear Eyeshadow in Grey Matters, and thicken the thin trace of the cat eyes effect. 5. Put on your Maybelline’s Define-a-Line Eyebrow Pencil and define your eyebrows. 6. Put on your Maybelline’s Great Lash Waterproof Mascara and curl your lashes. 1. Keep the lips natural. Use Maybelline’s Shine Sensational Lipgloss in Minty Sheer on your lips. It will give it a shiny effect.